It’s that time of year again. Commander (2017 Edition) is out this week, and this time around, it’s all about tribal. Well, almost. Regardless of whether the tribes excite you, Wizards’ has—as always—included a number of new cards that are likely to make their way into all sorts of Commander decks. In fact, I would argue that most of the best cards this year are not tribal. In addition to a number of expected reprints, this year’s Commander products include sixteen (16) new legendary creatures to play around with, and a slew of interesting cards that are only possible in the context of this kind of release. Today, I present my top 8 picks from C17. These are the cards I find most interesting, or most likely to see play—at least in some contexts. They might not turn out to be the absolute best of the best, but at the very least, keep an eye out to see what new strategies are enabled when brewers get their hands on them this Friday, August 25th. 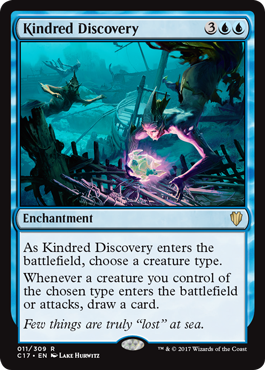 While it is certainly limited by its tribal nature, Kindred Discovery is the kind of card that could really turn a game in your favor quickly. Tribal decks—and creature-centric decks in general—often have the weakness of running out of steam. This is, of course, less of an issue for blue, but in the right deck, it’s not hard to imagine the Discovery becoming a must-answer target, else you outdraw the table in no time. Perhaps the best home for Kindred Discovery will be in blue/black zombie decks, like Gisa and Geralf or The Scarab God. With the ability to swarm the board early, Kindred Discovery can come down pre-combat, drawing you a number of cards if left unanswered. It is true that a card like this can make you a target, but tribal decks often already rely on swarming the board. For bonus points, try sticking this and Cryptic Gateway at the same time. It can be expensive to build a manabase, particularly for commanders with 3+ colors. Path of Ancestry is yet another commander-centric card that works to lower that cost, if only a bit. Beyond simply not having the financial means to load your deck with duals and fetches, many Commander players build multiple decks. 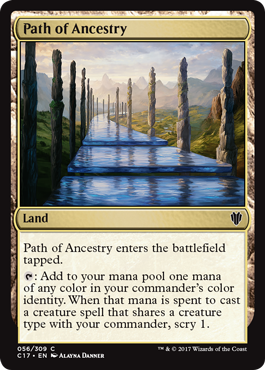 If you are even considering including any of the many dual-color lands that enter the battlefield tapped, Path of Ancestry is an auto-include for you. While it is ostensibly a tribal land, remember that one very important creature will always share a creature type with your commander—your commander. Path of Ancestry is interesting in that it is both situationally better and situationally worse than Command Tower. It enters tapped, but has the possibility of upside with its scry 1 clause. Most important, however, is that Path of Ancestry rewards you when you use it for its intended purpose, but puts no restriction on how you use the mana otherwise. There are many potential tactics for winning at EDH. One of the more common strategies employed is to avoid putting a target on your back for as long as possible. It’s not uncommon to see a player pull far ahead early on, drawing the attention of those around them, at which point they are knocked back and unlikely to ever recover. The Curses of C17 all do something few other cards do: they gain you incremental value over time while simultaneously drawing most of the table’s attention away from you. On top of that, they represent a legitimate threat, but atypically so. Each card in the cycle gives your opponents incentive to attack the cursed player, and when they do, you receive the benefits as well. And without negotiations otherwise, the only player incentivized to deal with the curse is the cursed player. Some commander decks simply cannot deal with enchantments for color pie reasons, which means there is a chance the curse sticks for good. 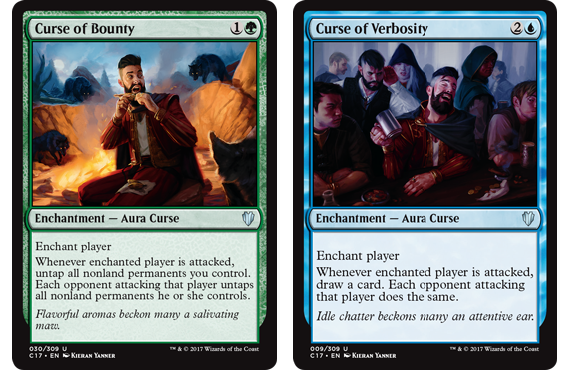 My personal favorites in the cycle are Curse of Bounty, which untaps all nonland permanents, and Curse of Verbosity, which draws a card. 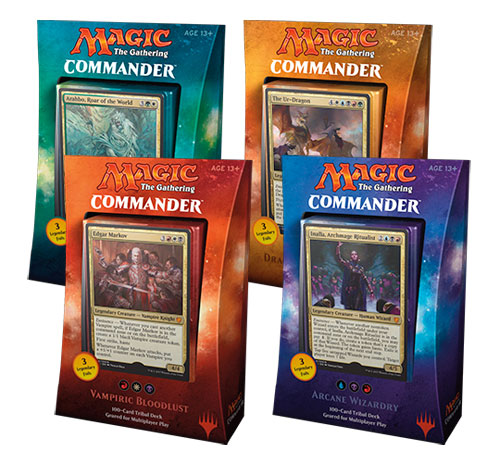 Commander is a format with a lot of mana rocks, so the temptation to untap them with Bounty to play more spells post-combat will be very real for some players. Verbosity is perhaps even better—if I get to draw a card for free, I will absolutely be attacking the cursed player any time I can do so without them eating the attacking creature. Remember that the number of creatures that attack is not important, so expect to see a lot of chip damage happening. Also keep your eyes on Curse of Opulence, which generates free Gold tokens that can be sacrificed for a mana of any color (back in my day, we called them Lotus Petals…). Bounty and Verbosity may be my favorite, but I have a feeling Curse of Opulence may actually be the best of the bunch. Vindictive Lich may not, admittedly, be the most amazing card on its own. However, it makes my list if only because of the potential in decks like Meren of Clan Nel Toth. Importantly, in a 3+ player game, this creature gives you Cruel Edict and Mind Rot and hits an opponent for 5 life when it dies. With the possibility to ditch the Lich* turn after turn (preferably via Skullclamp), it will become a problem for your opponents in no time. Meren is a very popular and powerful deck, so be on the lookout for Vindictive Lich. 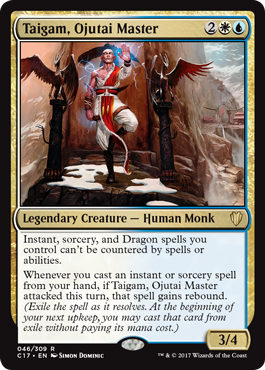 Taigam, Ojutai Master, like Yidris, Maelstrom Wielder, lets you break the game a bit if he sticks around long enough to attack. Unlike Yidris, however, Taigam only needs to attack, not deal damage to an opponent. While he may be limited to blue and white, this restriction forces you to solve an interesting challenge: once Taigam attacks, how do you make the most of his free rebound? There are a few ideas that come to mind. One option is to go small, using Taigam to gain as much value as possible from 1-mana cantrips and other draw spells. By going small, you can take advantage of Taigam’s rebound to cast several spells, draw several cards, and run a secondary strategy of your choice. 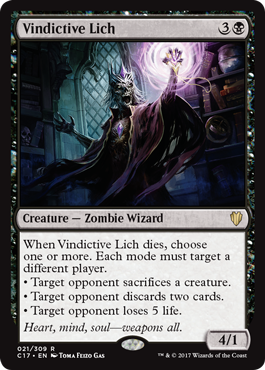 Another option is to focus on white’s affinity for enchantments to power out big enchantments like Omniscience (which is straight up busted on its own, let alone when your spells also have rebound). You can combine this with a general control build, running cards like Cryptic Command and Supreme Will, two modal spells that get around the drawback of giving a counterspell rebound. One final idea (among many others) is to use Taigam’s rebound with a white token generation strategy. How about getting a second Storm Herd for free, requiring your opponents to Wrath twice? Or for some silliness, what about Summon the School with rebound, giving you enough Merfolk to return itself from the graveyard and repeat the process again? Or maybe you fill the board with Cloudgoat Rangers and Springjack Shepherds and rebound blink effects? There are so many options for Taigam, Ojutai Master that I think we will see a lot of different approaches to building decks around him. None of this is even to mention the truly degenerate stuff, like rebounding Time Walk-like spells. Have fun! Five-color generals come with an obvious risk in the form of difficulty to cast. Most Commander players do not have huge amounts of cash to pour into a perfect mana base. 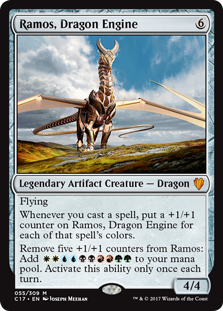 Ramos, Dragon Engine solves that problem in a big way, because Ramos is a commander that actually fixes your mana. With access to all five colors, you’ll be filling him up with +1/+1 counters in no time. Remove five of the counters to get 10 mana, and repeat. Cast Progenitus, and get your mana back immediately. Forget that Ramos is a dragon—that’s perhaps the least important aspect of this card. What can you do with Mairsil, the Pretender? What can’t you do? To be honest, there are so many possibilities with Mairsil that I’m not even sure where you’d start. With the power to steal the activated abilities of an artifact or creature card from your hand or anyone’s graveyard, Mairsil is the card from Commander (2017 Edition) with perhaps the highest potential for shenanigans. The question is, rather, what do you need Mairsil to be at this very moment? How about a mana rock like Basalt Monolith. Except Mairsil will untap since it only copies the activated abilities. Or maybe you need a second Nevinyrral’s Disk. These are just two of the least broken possibilities. 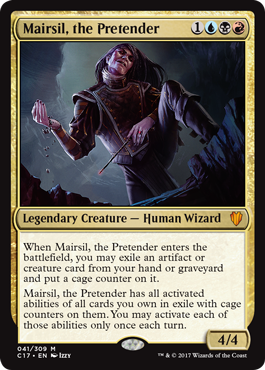 And let’s not forget that Mairsil, the Pretender gets to accumulate new abilities every time it enters the battlefield, meaning blink effects or recasting with Commander tax will continue to add more possibilities. Thankfully, the card limits activation to once per turn, which shuts off some of the more easily broken infinite combos. Regardless, expect to see the Pretender a lot in the near future. And finally, we get to my personal top pick from C17, Teferi’s Protection. If your Commander’s color identity allows you to play white, there is a very good chance you want this card. For an entire rotation, it locks down your life total, gives you protection from everything, and phases out all of your permanents, leaving very little trace of yourself as a player in the game that others can interact with. 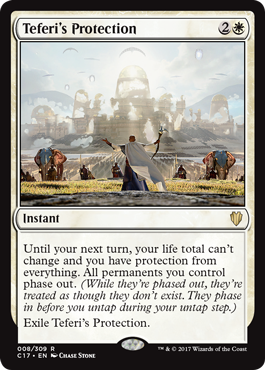 Others can still interact with your hand, library and graveyard, but if you cast Teferi’s Protection, there is little chance you lose the game until at least the start of your next turn. There are so many things this card dodges. Wrath effects? Check. Lethal attacks? Check. Permanent theft? Check. Phasing is an ability that has not been seen outside of a small handful of cards that appeared many years ago, which also means there is more or less nothing your opponents can do but wait for your permanents to phase back in. I would not be surprised if this becomes one of the more sought-after cards from this year’s Commander release, so if you’re interested, grab them while you can.